The family business remains the fabric of British society we are informed, and although in bookmaking the numbers are sadly but inevitably declining, many are happily still flourishing and one such is the Essex-based Pridmore family. The family have been involved in bookmaking for a period that stretches back nearly 80 years, started by a young man called Harold Pridmore. Born in 1906, he worked for a greengrocer in Stratford market in London's East End and being young, part of his various duties was to place bets for the stallholders. Harold was sharp enough to notice that he was not bringing back much in the way of winnings for the stallholders, and being an enterprising young man, saw the potential to better himself, so at the age of 24 he set up in business for himself. It was a wise move, as success came pretty quickly and before the start of the Second World War, Harold Pridmore had over 100 runners bringing bets to his Stratford base, with a pigeon hole being allocated to each runner. In addition a thriving credit business was established with over 20 phone lines in operation. The business continued throughout the war albeit on a lower scale, and prospered again in the immediate post-war years, a boom time for gambling. Harold was some bookmaker as he never hedged and in the 1950's would think nothing of accepting a £100 yankee! 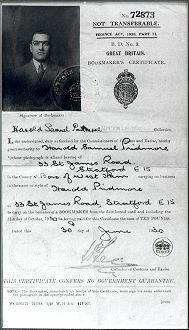 Times change however, and the advent of legalised betting shops witnessed Harold Pridmore, in common with a number of his generation, expressing grave doubts concerning their suitability. His son Roy recalls: "He frankly thought people would never walk off the street into a betting shop and although he did open one shop, his heart was never in the idea, and with his health beginning to decline, he eventually retired". Rowland Pridmore, generally known as Roy, had worked for his father from the tender age of 14, and while still at school had studiously absorbed all the intricate rudiments bookmaking entailed. He disagreed, like most young men of the time, with his father's views, believing betting shops had a considerable future. Even at 21, Roy was of the opinion that he possessed enough experience to take the plunge and emulate his father by setting up on his own, so he obtained his bookmaker's permit and his first betting shop in Walthamstow. "Unfortunately for me I opened on Boxing Day 1962, right at the start of one of the worst winters on record. I believe there was no horse racing for nearly three months, and of course in those days there was no BAGS." "I survived that dreadful winter because I was on my own and no staff to pay, and had a good landlord who allowed me plenty of leeway with the bills. I also knew it could hardly get worse." Despite the worst of starts to his fledgling venture, Roy Pridmore was entirely convinced he had made the right decision as he correctly predicted the bright future betting shops would attract. enviable position of owning three shops, but there was a snag." "The shop I was running myself was prospering but I had to face the fact that I was being 'turned over' in the other two. It was a position I could not really tolerate, but you must remember that at that time security was virtually non-existent." In 1976, Roy Pridmore sold two of his shops to fellow Essex bookmaker William Claridge and had to close his original Walthamstow shop. "In view of my experience, I wanted to learn about all aspects of security and eager to see how the bigger firms operated in this area, went to work for Victoria Sporting and Racing. It was a learning experience." 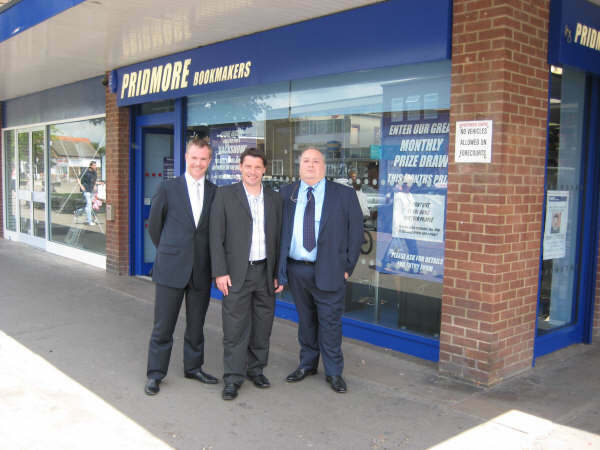 The Pridmore business is a family business in every sense with Shaun and Roy at the head of affairs, supported by the other family members Chris and Sara. Don Roberts is the General Manager, having joined the company in 2003. Whilst Charles Smith and Alan Dennis are the senior managers with a wealth of industry experience. Roy comments: "They are responsible for the day to day running of the business and provide a valuable link with our staff." "I believe a business can rise and fall with its staff and we are fortunate to employ excellent people who are geared to serve the punter. This is where the independent can benefit." "Not surprisingly, in view of my previous experiences, our firm is very strict on security and always willing to consider any innovation in this sphere." Having a strong management team leaves Roy and Shaun the focus to concentrate on developing the business further. "Of course it's not easy to expand nowadays," says Shaun. "However, despite the pitfalls we are still keen to acquire further shops, preferably in the Essex area or in a radius of one hour. We are of the opinion that new licences can be obtained." "I think it's becoming more and more difficult for the one or two shop owners, but I am very confident about the future for a well-run business willing to invest in new technology and generally adopt a modern approach." "Horse racing is still the principal betting activity among our punters but I agree with the general consensus that interest in sports betting is increasing all the time, particularly in football which has benefited from increased media coverage." racing are also gaining in popularity. Younger punters are notably enthusiastic about sports betting and FOBT's and with the future in mind, should be given every encouragement." "Of prime importance to bookmaking is the ability to adapt to change, which is not only vital but can be both beneficial and profitable." "I don't think there is too much horse racing and the present fixture list is just about right and should not be tampered with. There should be a minimum of three meetings per day." "All weather racing has proved a most welcome introduction - a great boon during adverse weather. Punters are now more used to it and I would estimate if jump racing is abandoned we would still take 75% of our usual turnover on all weather racing and greyhounds." Pridmore Bookmakers were amongst the first members of the BBOA with Shaun acting as a director for 3 years. In November 2002 the BBOA merged with BOLA to create the ABB (Association of British Bookmakers) & Pridmore Bookmakers are members of this trade body. Pridmore Bookmakers are also members of the Independent Betting Arbitration Service and we feel this service should be supported as the industry needs an independent body to arbitrate in betting disputes. We must be self-regulated to escape any further unrequired red tape," says Shaun.The Independent Betting Arbitration Service. have their financial ability to trade and creditworthiness thoroughly investigated." "We subscribe to SIS and Turf TV, which in my view is expensive, but the overall package produced is good and the service is a most necessary innovation, as televising live pictures in the shops is now a standard requirement." "One innovation that we are now using is the automatic settling machine Bet Capture. This offers 100% security with the image captured in the memory of the computer allowing bets from all our shops to be downloaded to head office." "The machine will automatically settle bets and allow the shop manager to become more effective and proficient on the public relations side, which is something we believe in as a modern business."